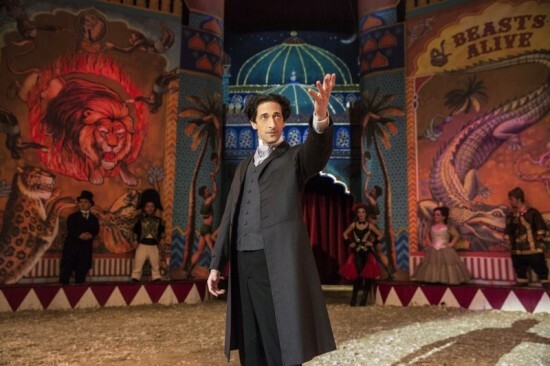 Today A+E Networks officially announced the premiere of the two-part miniseries “Houdini,” staring Academy Award winner Adrien Brody (The Pianist) as Harry Houdini and Kristen Connolly (House of Cards) as Bess Houdini, set to air Sept. 1 at 9 p.m. ET/PT on History. Part 2 airs the following night at the same time. You may recall that last September Connolly consulted me and Houdini expert John Cox about Bess’s character. The series was originally set to air earlier this year until the network postponed it. You can read A&E’s press release below or on their site. History Premiers Houdini, Two-Night Miniseries Sept. 1 at 9 p.m.
HOUDINI is a Lionsgate/A+E Studios Co-Production. Gerald W. Abrams (Nuremberg, Family of Spies) and Andras Hamori (Sunshine) serve as executive producers of HOUDINI. Academy Award nominated Nicholas Meyer (The Seven-Per-Cent Solution) is writer and Academy Award nominated director Uli Edel (The Baader Meinhof Complex, Hotel Adlon) helms HOUDINI. Academy Award winning veteran Patrizia von Brandenstein (Amadeus) is production designer and Karl Walter Lindenlaub, whose work ranges from American blockbusters (Independence Day) to award-winning art house movies (Black Book) is cinematographer. Dirk Hoogstra and Julian P. Hobbs are Executives in Charge of Production for HISTORY. This entry was posted in Adrien Brody, Bess Houdini, Celebrities, Film, Harry Houdini, Harry Houdini, Houdini, Kristen Connolly, Magicians, Portrayals, TV and tagged a+e, adrien brody, beatrice, bess, bess houdini, bessie, harry houdini, houdini, kristen connolly, miniseries, premiere, television, tv show. Bookmark the permalink.